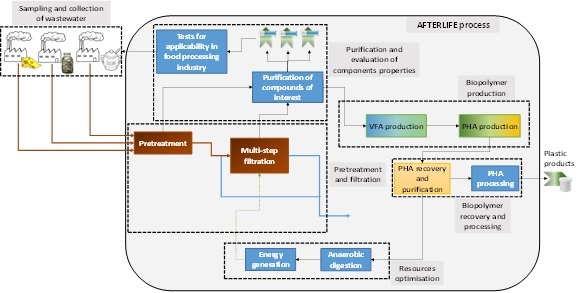 AFTERLIFE (Advanced Filtration TEchnologies for the Recovery and Later conversIon of relevant Fractions from wastewater) proposes a flexible, cost- and resource-efficient process framed in the zero-waste and circular economy approach for the recovery and valorisation of the relevant fractions from wastewater. The first step of such process is an initial step consisting of a cascade of membrane filtration units for the separation of the totally of solids in wastewater. Then, the concentrates recovered in each unit will be treated to obtain high-pure extracts and metabolites or, alternatively, to be converted into value-added biopolymers (polyhydroxyalkanoates). Process Optimisation: Process optimised design through the use of outputs from MDO strategies in order to carry out conceptual design and basic engineering of the proposed solution .